The Norstar Caller ID Card has four Caller ID Trunks or Lines. The Digital Trunk Interface (DTI) cartridge provides access for up to twenty-four digital T1 or ISDN-PRI channels. It comes equipped with built-in Channel Service Unit (CSU) functionality to support the integrity of digital signaling. 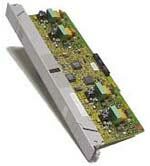 The core Modular ICS can support up to two DTI's for a total of forty-eight T1 or ISDN-PRI (digital) lines. DTI's cannot be installed in Trunk Modules. The ISDN-PRI Enabler Soft Key is required to configure the Digital Trunk Cartridge (DTI Card) as a PRI card. 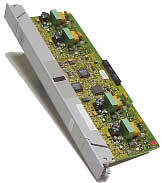 The Nortel 8 port TCM expansion card adds 8 stations to the Compact ICS configuration for a total of up to 24 station ports. This card bridges the gap between the 16 stations of the Standard CICS software. DID Trunk Cartridge provides four 2 wire direct inward dialing trunks. Requires one slot in a copper or fiber trunk module. E & M Trunk Cartridge provides 2 E&M Type II Trunk interfaces..
One Services cartridge supports all clocking required, regardless of the number or mixture of DTI's and/or ISDN-BRI Interface cartridges. Uses Slot B of the core ICS, and cannot be used if a Copper Expansion Upgrade Cartridge is installed. This cartridge also contains the clocking service required to support T1 or ISDN-PRI on a DTI cartridge or an ISDN-BRI Cartridge. The Combination Fiber 6-Port Services Cartridge fits into slots B and C of the Modular ICS and works with XC software, and regular DR 1.1 and later software. Requires fiber connections.